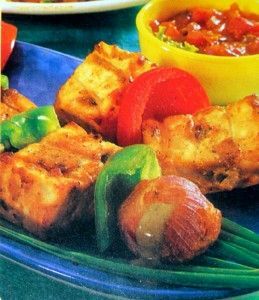 300 gm paneer – cut into 2″ square. 1 huge capsicum – cut into 1″ pieces. 1 onion – cut into 4 pieces. 1 cup curd – hand in a muslin cloth for 30 minutes. A little drops of orange color or a pinch of haldi. 1 and half tbsp oil, 1 tablespoon cornflour, 1/2 tablespoon amchoor, 1/2 tablespoon black salt, 1/2 tsp red chilli powder. 3/4 tablespoon salt, 1 tbsp masala, 1 tbsp ginger – garlic paste. 1. Mix all components of the marinade in a bowl. Include paneer. 2. Arrange paneer on the greased wire rack. The paneer pieces are done, put capsicum, onions and tomato together in the left over marinade & mix well to coat the veggies. 3. Set your oven at 200 degree Celsius using the convection mode and press begin to preheat. 4. Put the tikkas in the hot oven. 5. Set the preheated oven for 15 min. cook the tikkas fo 15 minutes. 6. Spoon some melted butter on the tikkas and grill for 5 minutes. Sprinkle talk masala & lemon juice. Mix all components of the marinade in a bowl. The paneer pieces are done, put capsicum, onions and tomato together in the left over marinade & mix well to coat the veggies. Set the preheated oven for 15 minutes. Spoon some melted butter on the tikkas and grill for 5 min.